Hi everyone! Today I have a major case of Monday Morning Blues, partly because I had the most perfect Sunday ever yesterday. My Mum came down to visit me in London and we went to the Met Police's Crime Exhibition at the Museum of London at lunchtime. It features evidence from crimes since the 19th century including ropes used to hang people, some weapons used by notorious criminals such as the Krays and sketches from the court room. Me and my Mum find crime so interesting and I would definitely recommend the exhibition if you are the same. 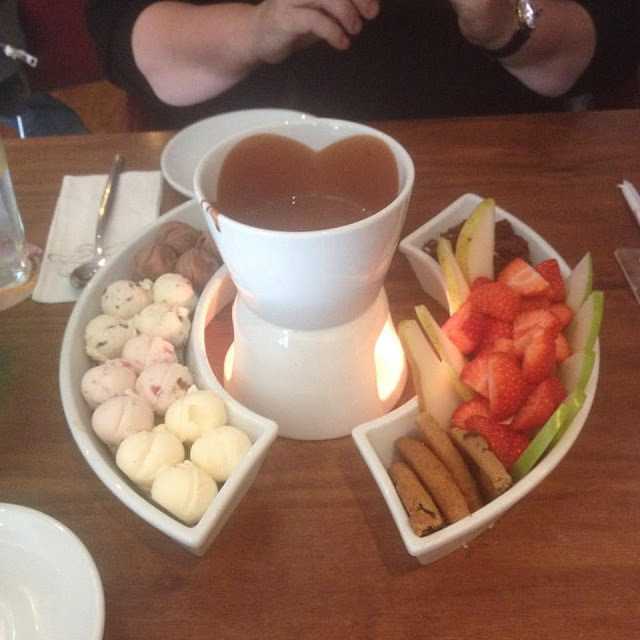 After that we tubed it on over to Leicester Square and ended up having the naughtiest lunch ever - this chocolate and ice cream fondue. I was in utter heaven - best cheat day I've had in a long time! It was only £22 for both of us which I thought was quite reasonable given the sheer quantity. As you can see you get the naughty cookies, brownies, chocolate and a little bowl of nuts as well as the ice cream, but then lots of fruit as well so it was a really nice treat. After having a nosy round the shops we had an italian for dinner before saying goodbye. It was the most perfect day and I definitely can't wait to go home again next weekend to see my fam. This looks so good, I need a cheat day soon. I also need to check out the Crime Exhibition, I didn't know it was even on that is right up my street.